The best way to describe Ohio University is that it feels like a small liberal arts college, offering students ongoing opportunities to build relationships with faculty and explore departments with a very hands-on program for undecided students. The Vice President for Student Affairs told us he gives his cell phone number to all students and parents. But Ohio University has 17,000 students in the quaint southeast Ohio town of Athens, Ohio, a town of 22,000 that surrounds the campus. Plentiful shopping and eating options are just outside the university gates, and Athens, which was a stop on the Underground Railroad, is an artistic community. Founded in 1804, Ohio University is the oldest college in Ohio and the oldest in the Northwest Territory. Known for its Scripps School of Journalism (Matt Lauer is an OU alumnus), OU has three full TV studios and multiple radio studios. OU also has an Oxford-style Honors Tutorial College, where students have weekly one-on-one interaction with professors and mentors to dig much more deeply into their coursework. HTC graduates earn their degrees directly from this college, but can major in almost any subject offered at OU. University College is the program for students who enter OU undecided on their major, but the program is open to all first-year students, who also have the option to live in themed learning communities. This first year experience program gives students a taste of academic options while ensuring they are on track to fulfill graduation requirements. 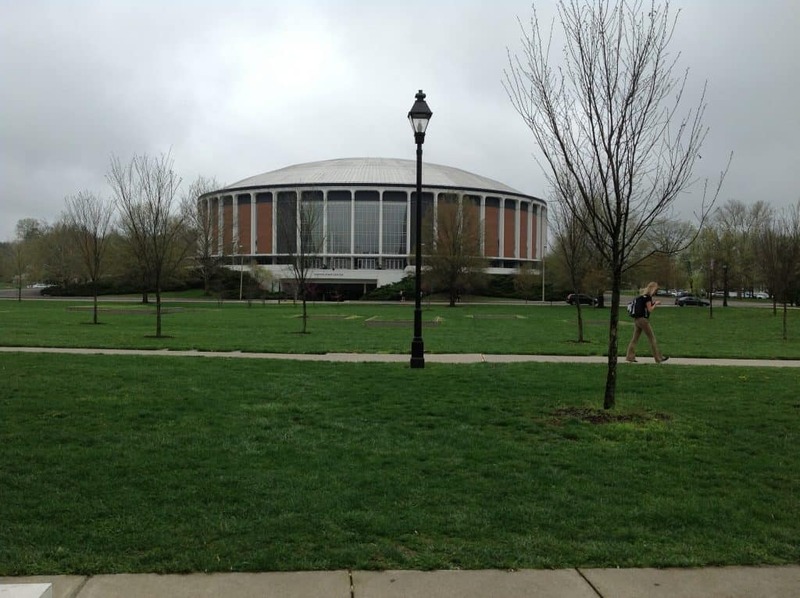 The Convocation Center is where basketball games are played…and also….a dormitory!!!! OU’s strong business program includes standard business programs (finance, accounting, marketing) as well as majors in entrepreneurship, business pre-law, international business and sports management. My tour guide Ryan was a broadcast journalism major with a sports management minor, and he spoke highly of both programs. The average class size across all majors is 30, and most classes, including lectures, are capped at 60 students. The student-to-faculty ratio is 20:1. OU ‘s sports teams are Division I and tickets to all home sports games are free for students. School spirit runs high and many students are involved in the more than 400 student groups on campus. 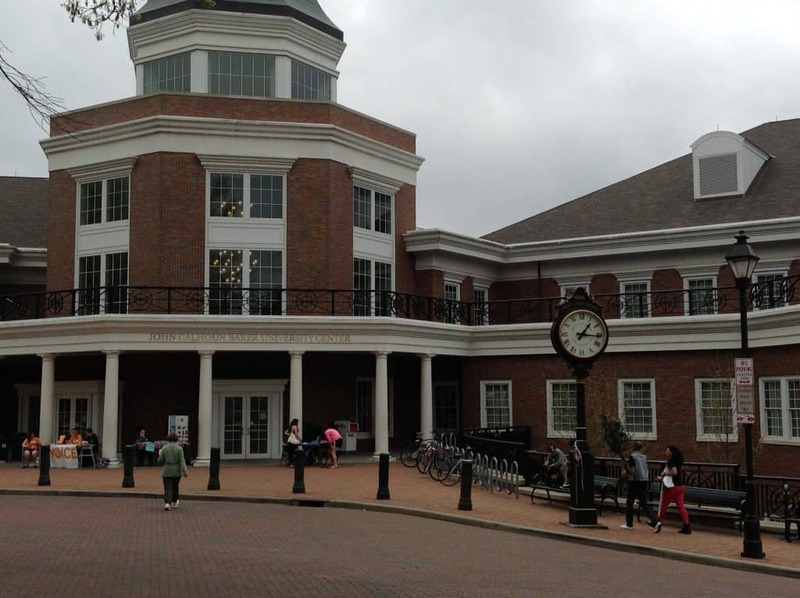 There is a Hillel and about 18% of students are non-Ohio residents. About 10-12% of the students join fraternities and sororities. OU is not a member of the Common App; they have their own online application and offer rolling admissions. Essays and letters of recommendation are optional. Applicants to the Honors Tutorial College must apply by December 1; the general deadline is February 1. Financial aid is offered for merit and need; the earlier you apply, the better. Higher test scores and grades earn better scholarships. I loved the feel of Ohio University. For students looking for a big-school atmosphere, this is a great place. For students looking for a smaller feel, Athens is a great college town and OU embraces students in a way you usually only see at small schools.